This entry was posted in Global Economy, Inflation, The Political Money System and tagged depression, inflation, Stansberry. Bookmark the permalink. I cannot help but think of the Ostrich burring his or her head in the sand with the regards to the current monetary system. Money being created from debt with no provision for the interest that is agreed to be paid on the debt ever being created. Even if we were to pay off all the debt in the global economy at this time there would be a huge shortfall since there has never been any provision for the interest money to be created regardless of the money being created out of thin air by debt. It seems to me that in order for the monetary plans in place today depend on obsolescence and waste. The faster that something becomes obsolescent thereby creating the need for a newer model that is not obsolete. As long as this continues to grow / climb the current system could work. However, when we take into account technology expanding at ever increasing speed and creating robots that can do the work of 5-10 workers we create unemployment. Even with an improved economy those jobs will never return since a robot is now doing those jobs. We live in a finite world of resources that will eventually run out. Our present energy sources will dry up and we will no longer have the power to create sustainable systems which must be built with the unsustainable energy sources that we have available today. 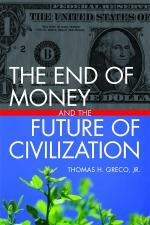 I wish all of mankind the best but do not believe that it can happen under the current monetary systems. how will it be destroyed if there are so many more of them? ?